The O’Briens are an illustrious and prominent clan that has shaped the history of Ireland. The name, also spelled O’Bryan or O’Brian, means “of Brian” indicating descendance from Brian Borumha mac Cennetig, or Brian Boru, the celebrated High King of Ireland. Brian Boru (925-1014) received the throne of Thomond (an area which covers much of modern day County Clare as well as parts of Limerick and Tipperary) after his elder brother, Mathgamain, was killed in 976. By 1002, he had attained the title of High King of Ireland, subjugating all the other kings in Ireland under his rule. The King of Leinster Máelmorda mac Murchada, aided by the Dublin Vikings, rebelled against Brian’s rule. The two armies met on the field of Clontarf (now a suburb of Dublin) in 1014. Brian Boru’s army won, but at the cost of Boru’s life. 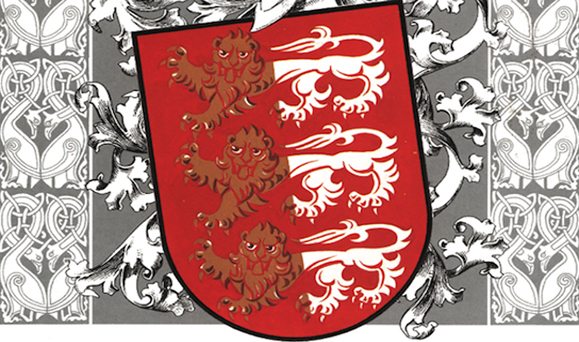 During the Tudor conquest of Ireland, the hereditary titles Earl of Thomond, Viscount of Clare, and Earl and Baron of Inchiquin, were contracted for the O’Briens to garner their support for the English crown. However, many of the clan supported Ireland’s independence. The O’Briens also played important roles in the battles of America. A resounding 231 O’Briens took part in the Revolutionary War. Jeremiah O’Brien helped orchestrate the capture of the British ships the Union and the Margaritta during the first naval engagement of the war. George Morgan O’Brien was Union Brevet Brigadier General and acted as a model of bravery for the O’Briens during the American Civil War. Fitzjames O’Brien, an immigrant to the U.S. and writer for Harpers and Atlantic Monthly, lost his life while serving in the NY National Guard during the Civil War. A more recent O’Brien patriot, George H. O’Brien Jr, earned the Congressional Medal of Honor for his actions during the Korean War. In Ireland, William Smith O’Brien (MP) carried the fighting spirit of the O’Briens by leading the Young Ireland Movement. He was to be hanged, drawn and quartered because of his leadership in a bloodless peasant insurrection that distastefully became known as “The Battle for Widow McCormack’s Cabbage Patch.” His sentence, however, was commuted, and he was transported to Australia. O’Brien was eventually pardoned after attempted escapes and five years in prison. A statue of him now stands on Dublin’s O’Connell Street. His daughter, Charlotte O’Brien, was an activist against the unfit conditions aboard emigration ships. And because of her efforts, the Board of Trade eventually imposed stricter constraints. The O’Briens are well known in many fields of the arts and entertainment. In the literary world, the O’Briens have produced such talent as Edna O’Brien, who had great early success in the 1960s with her Country Girls trilogy, despite the fact that they were banned throughout Ireland. O’Brien’s latest issue is a revealing and powerful memoir, A Country Girl, to be released in the U.S. in April. Tim O’Brien is another literary luminary who has written Tomcat in Love and The Things They Carried, a fictionalized account of his time in Vietnam. O’Briens have been in the film industry since its inception. Eugene O’Brien was an early pioneer in the silent age of film and received a star on the celebrated Hollywood Walk of Fame. George O’Brien was a rugged cowboy in both silent and talkie films of the 1930s. Pat O’Brien “Hollywood’s Irishman in residence,” played good-guy Irish priests and cops in many Warner Bros. crime dramas of the 30’s and 40’s. Edmond O’Brien won a best supporting Oscar playing a sweaty press agent in 1954’s The Barefoot Contessa. Virginia O’Brien was MGM’s deadpan singing comedienne in the 40s and 50s. Seven-year-old Margaret O’Brien almost stole Meet Me in St. Louis from Judy Garland. Richard O’Brien was the writer of and an actor in the cult classic The Rocky Horror Picture Show. Today, the O’Briens can watch a few of their own on some of the best-liked shows on television. Soledad O’Brien anchors CNN’s morning news program Starting Point. And for those O’Briens who stay up late, there is Conan O’Brien, the tall, ginger comedian who hosts the late night talk show Conan on TBS. In technology, Denis O’Brien, 2012 Business 100 keynote speaker and subject of this issue’s cover story, leads the industry in introducing cellular phone service to the Caribbean and Pacific Islands. The founder of Digicel, the leading service provider in the region, Irish-born O’Brien was recently praised by Bill Clinton in Time magazine for his work in Haiti. The O’Brien name has been used on everything from battleships to booze. Brian Boru Vodka is a popular drink in Ireland, and Lily O’Brien’s chocolates are famous the world round. If the O’Briens’ long and celebrated past is any indication, they will remain a talented clan for many years to come. I’m so proud of my maiden name O’Brien.never new we have so many famous people in our clan.always glad to learn more. …Richard O’Brien was born Richard Smith; 25 March 1942.